Industrial packaging includes non-retail facing thermoformed products and packaging, generally used by OEMs and their supply-chain partners, to protect products and facilitate assembly, manufacturing, and shipping efficiencies. Dordan has 60-years experience designing and thermoforming cusotm plastic packaging and product solutions for industrial end-markets. Plastics thermoforming lends itself to the production of high-quality, highly-engineered products and packaging that offers functional performance features. These thermoformed trays and components fall outside the realm of consumer product packaging, requiring a different set of design considerations. ISO 9001:2015 certified for the design, manufacture, and distribution of custom thermoformed products and packaging, Dordan offers full-service industrial package design, tooling, and production in-house. The same team of thermoform designers that engineer the package design also produce the aircraft-quality aluminum tooling, allowing for more intelligent quality control as there are no software and machining translation errors between design and production. This integrated approach to industrial packaging allows for the production of high-quality industrial packaging solutions in quick turn-times at competitive pricing. 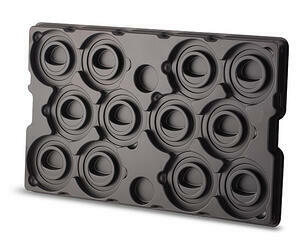 Optimize your assembly, manufacturing, and shipping operations with thermoformed dunnage trays. Meet the performance requirements of injection molded parts with redesigned thermoformed components.